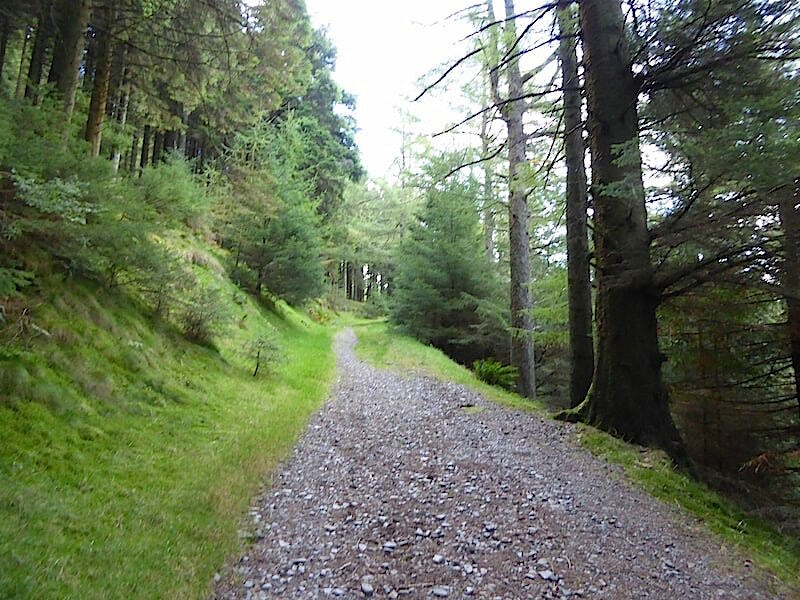 On the way to Whinlatter Fell via the forest road which begins just a few yards from the Whinlatter Visitor Centre. 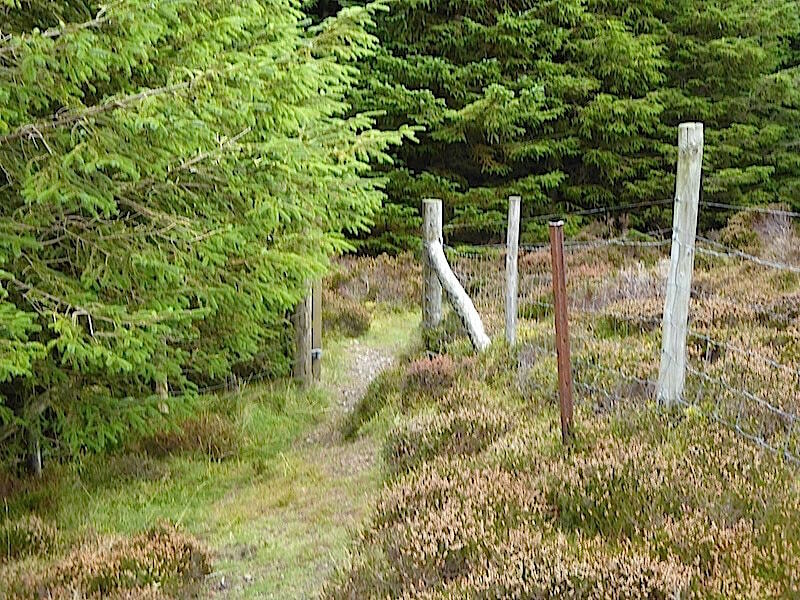 The stile at the end of the forest road, once over this the short but steep climb up to Whinlatter begins. Closer acquaintance with the stile. 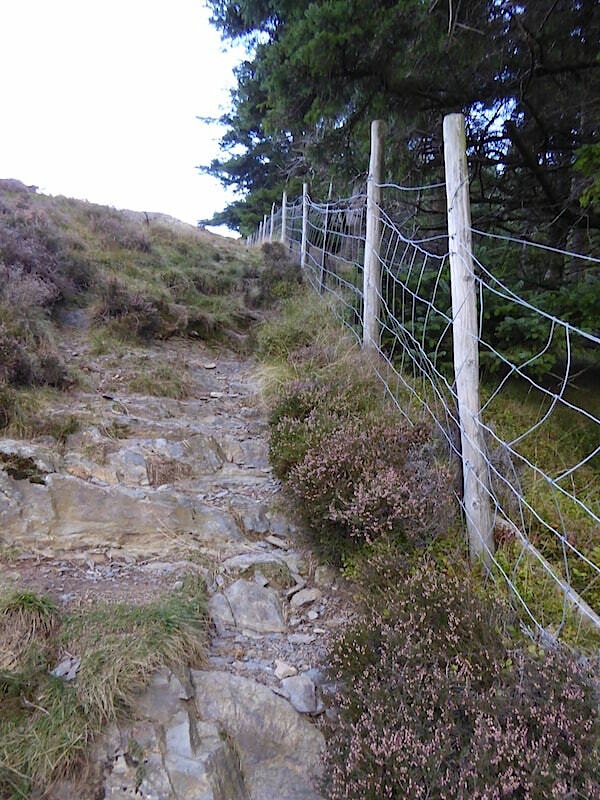 Over the stile and its a right turn followed by a steepish climb. 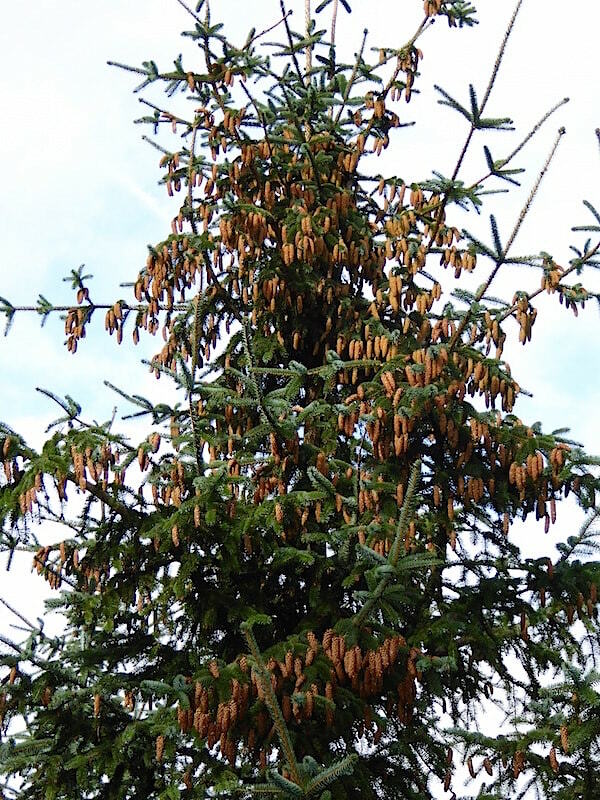 This is the view looking up from the stile at the path running beside the fence. The fence came in handy from time to time. 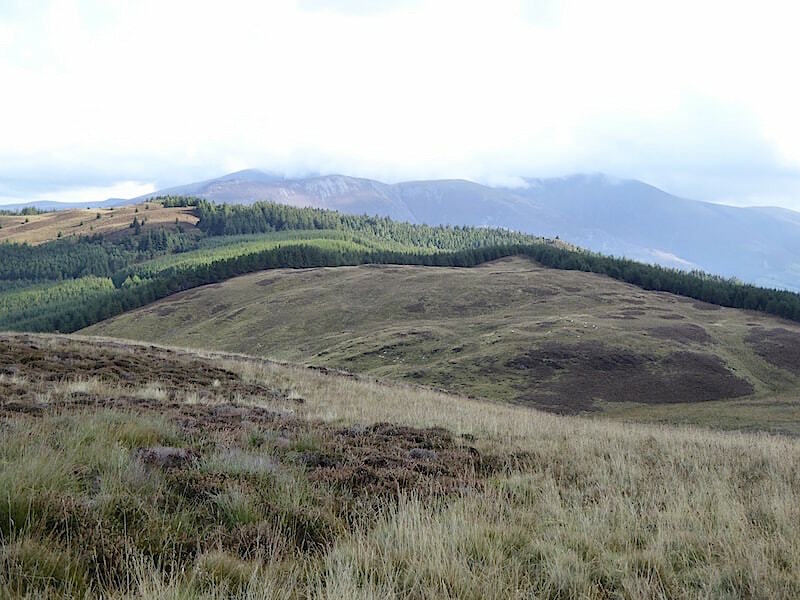 From the path a view over Hobcarton Plantation to Grisedale Pike. 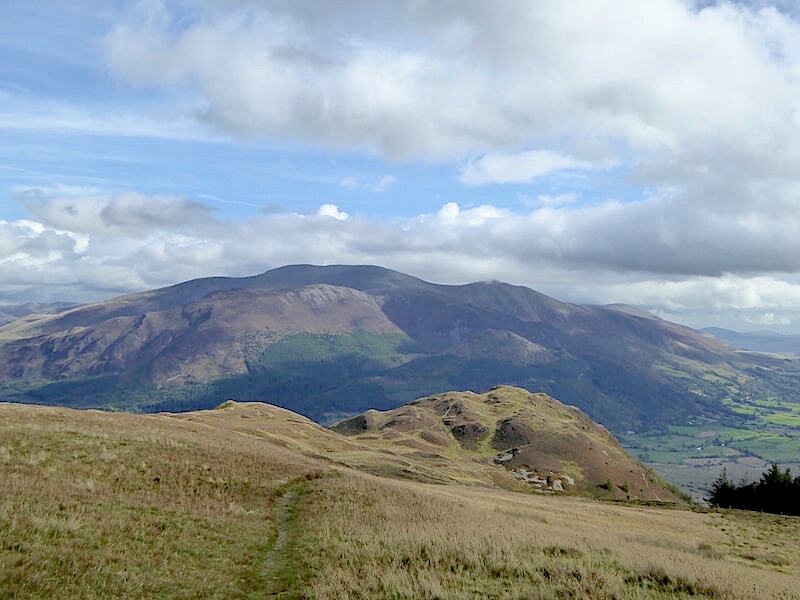 On Whinlatter summit looking towards Brown How. 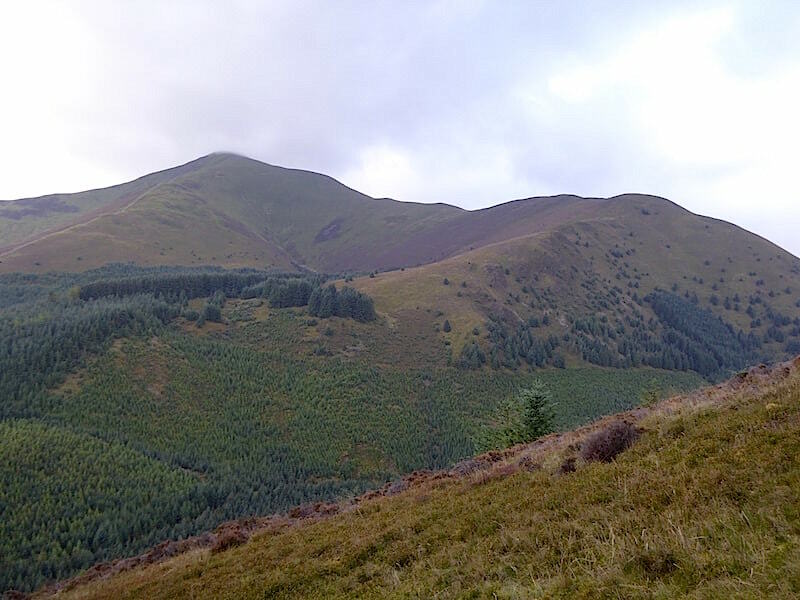 Lord’s Seat from Whinlatter summit. 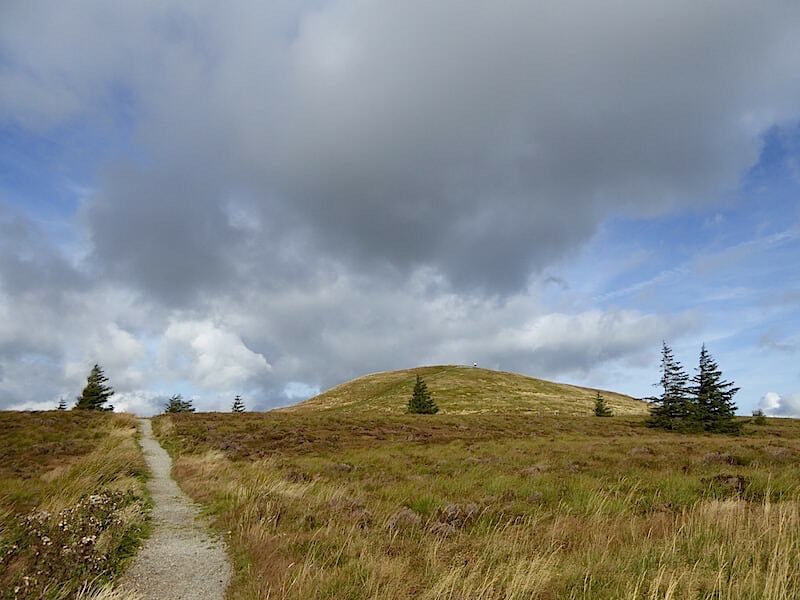 Broom Fell from Whinlatter summit. 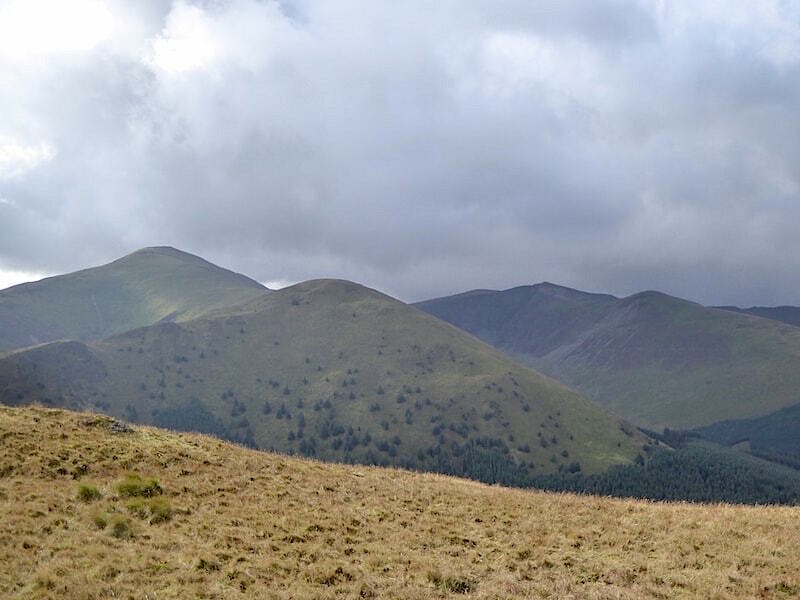 Left to right – Grisedale Pike, Hobcarton End, Hopegill Head and Ladyside Pike from Whinlatter summit. 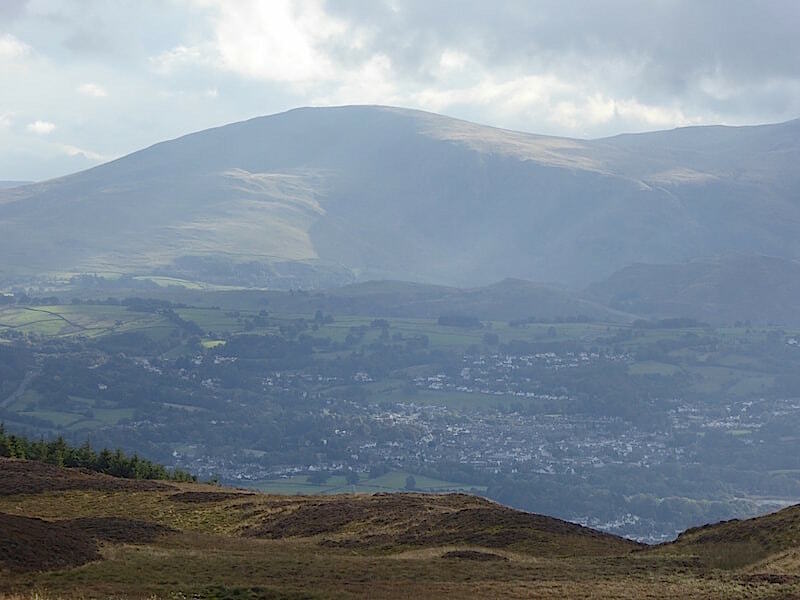 A close up of a very hazy Clough Head beyond Keswick from Whinlatter summit. 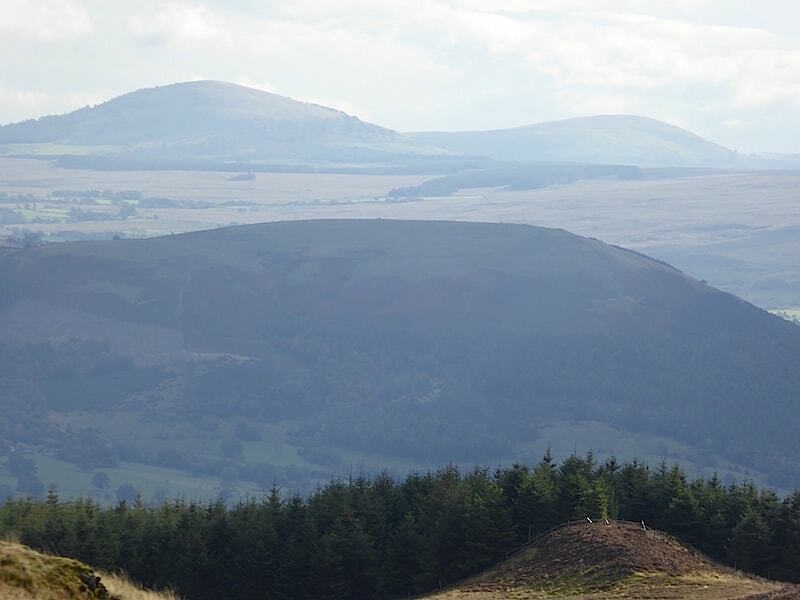 Another hazy close up, this time of Great Mell Fell and Little Mell Fell from Whinlatter summit. 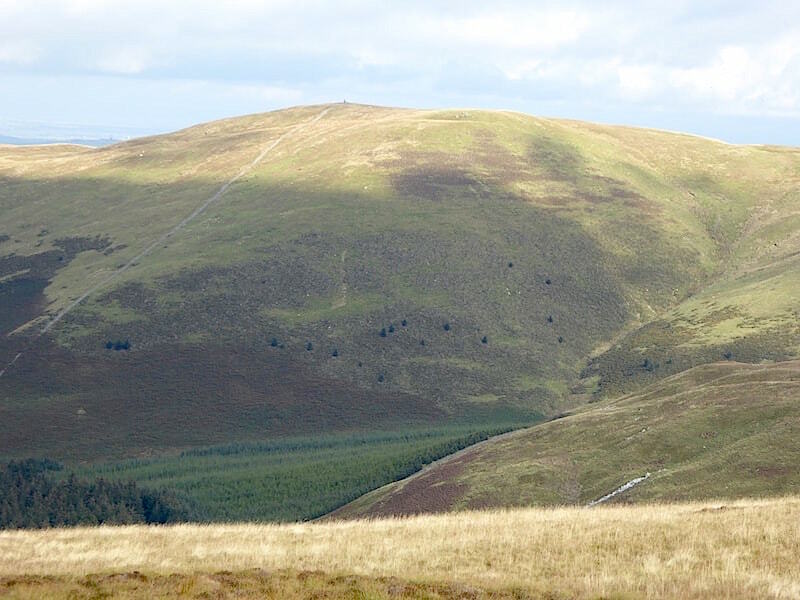 Heading off Whinlatter summit towards Tarbarrel Moss and the tree line. 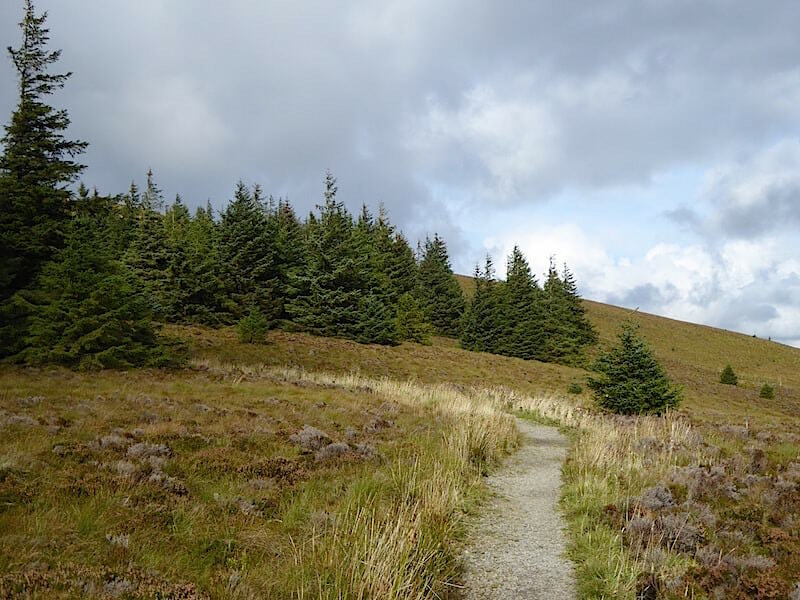 Tarbarrel Moss, normally a rather wet area, but we walked straight across today without any problems, thanks to the lack of rain throughout September. 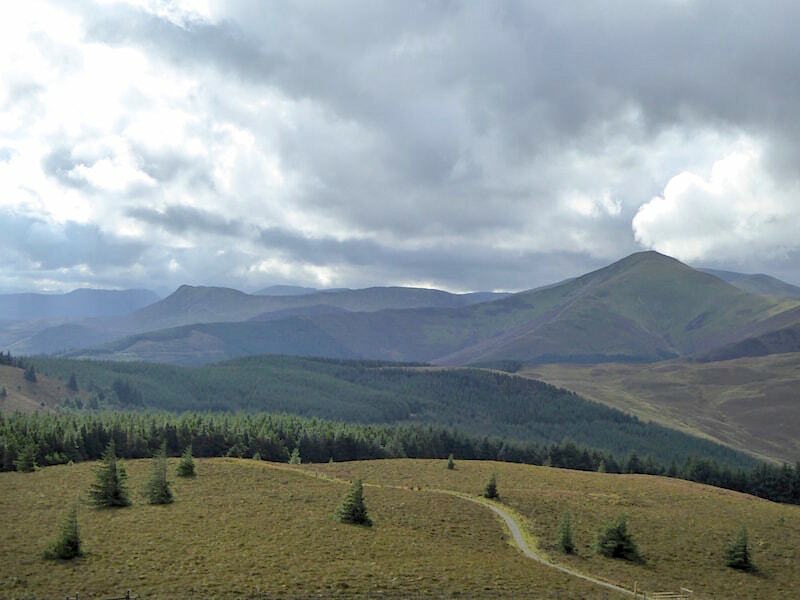 Lord’s Seat and its forests. 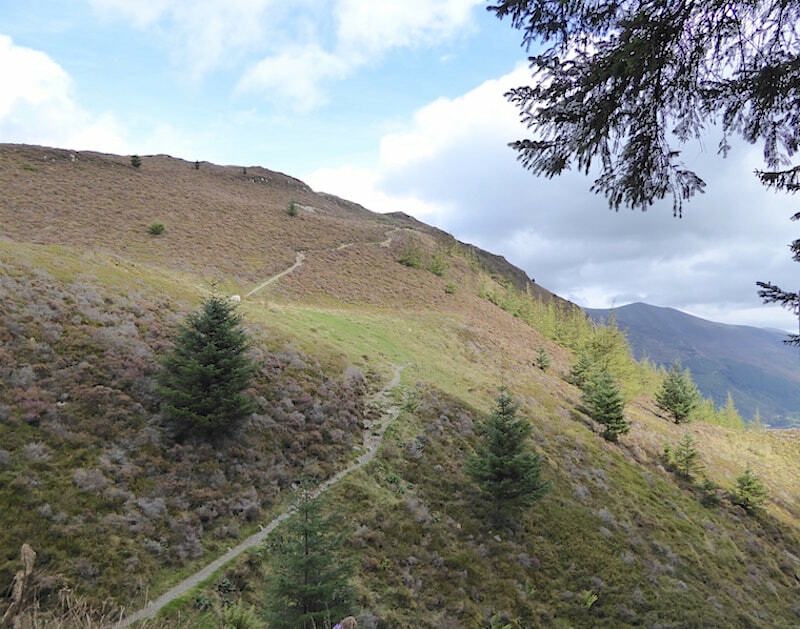 A look back at Whinlatter. The gateway at the corner of the tree line. 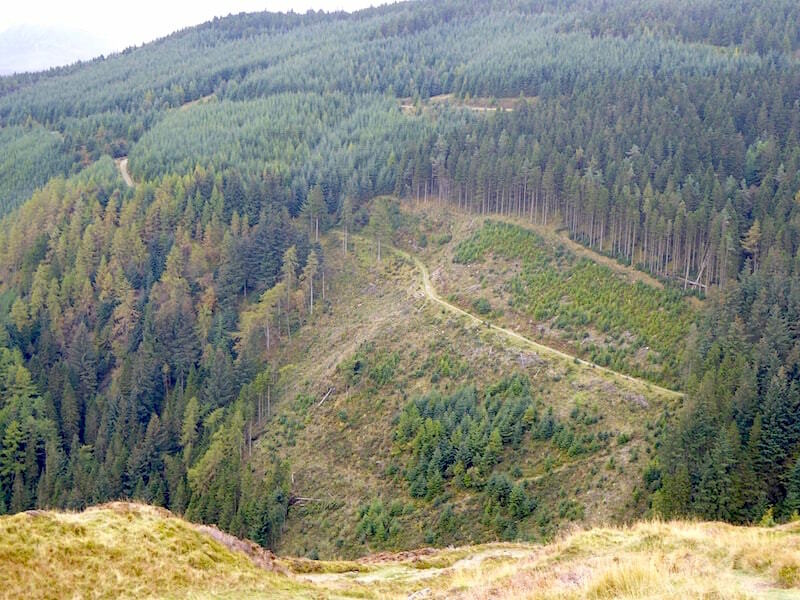 The path drops down a short distance through the forest and then joins up with a forest road. 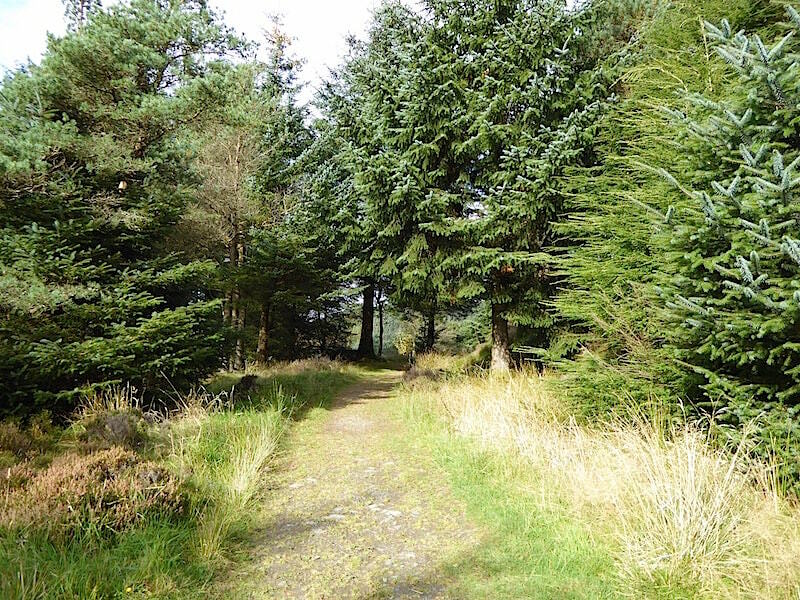 On the forest road and on the way towards Lord’s Seat. 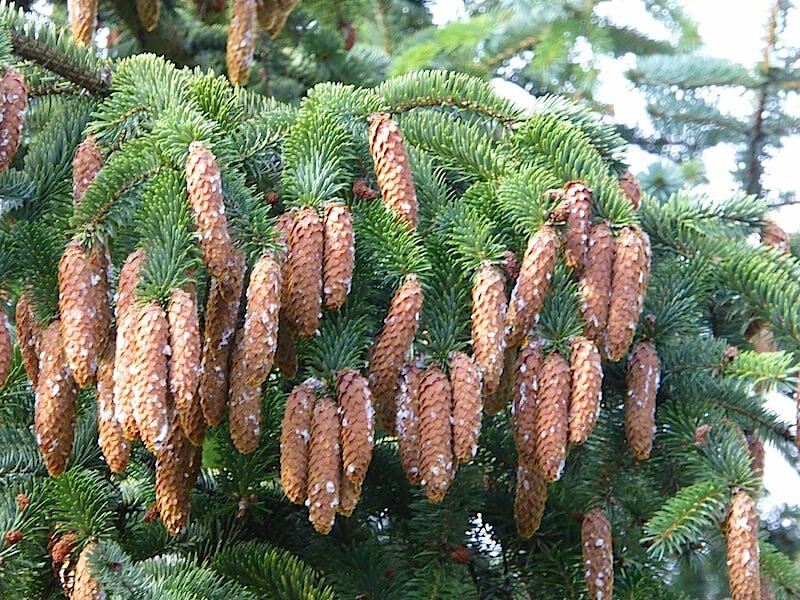 Pine cones in abundance on this tree. Comparisons with similar objects, which are best left unmentioned, were made at this point. 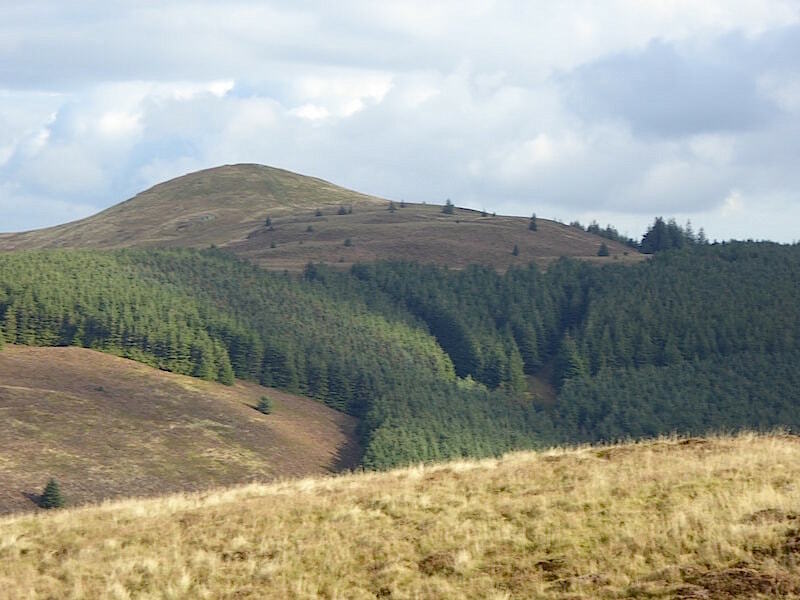 We’re almost out of the forest now and on to the open fell side of Lord’s Seat. 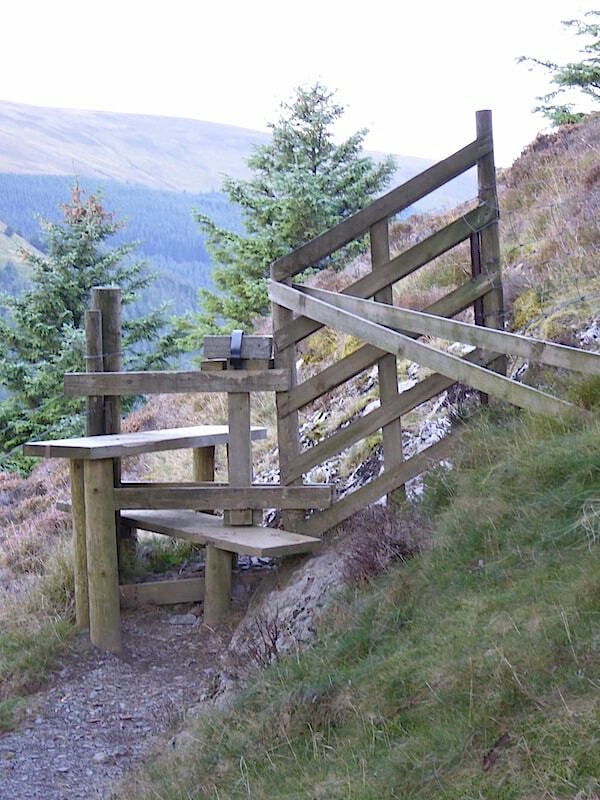 We’re now reaching the last part of the climb. However, when you round the corner you find that there is still a little further to go. 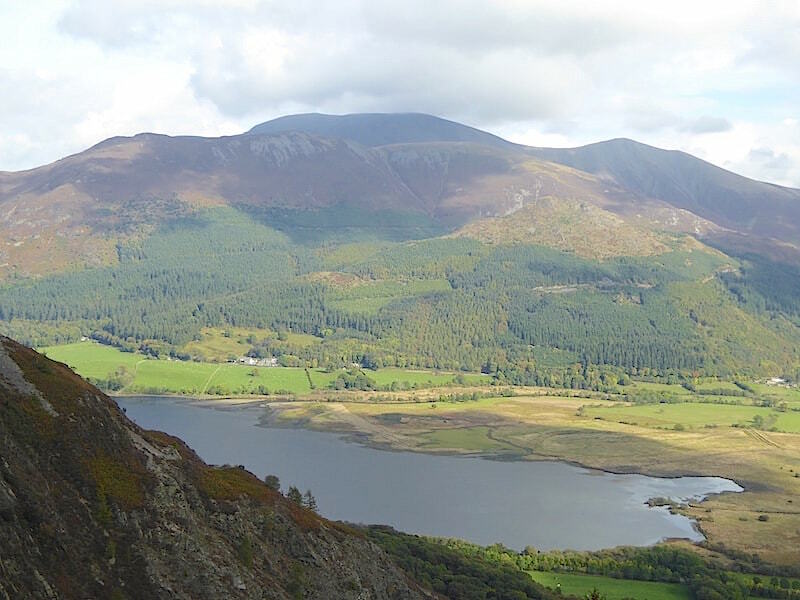 At last, we’re on Lord’s Seat with a great view of Skiddaw now that the cloud has gone. The view of Barf just below us isn’t too bad either. 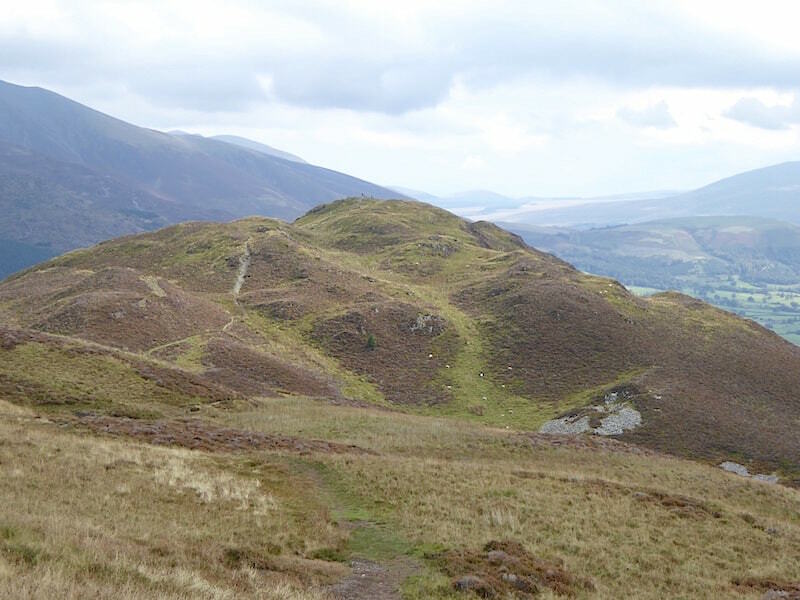 A look back at the ascent path with the two prominent peaks of Causey Pike on the left, and Grisedale Pike on the right. 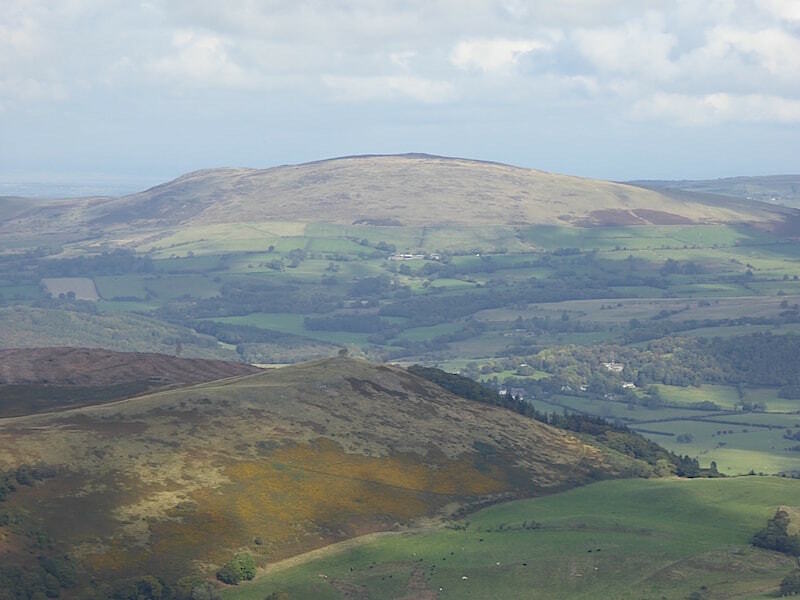 I don’t know why but this part of Lord’s Seat always feels a little bit surreal. 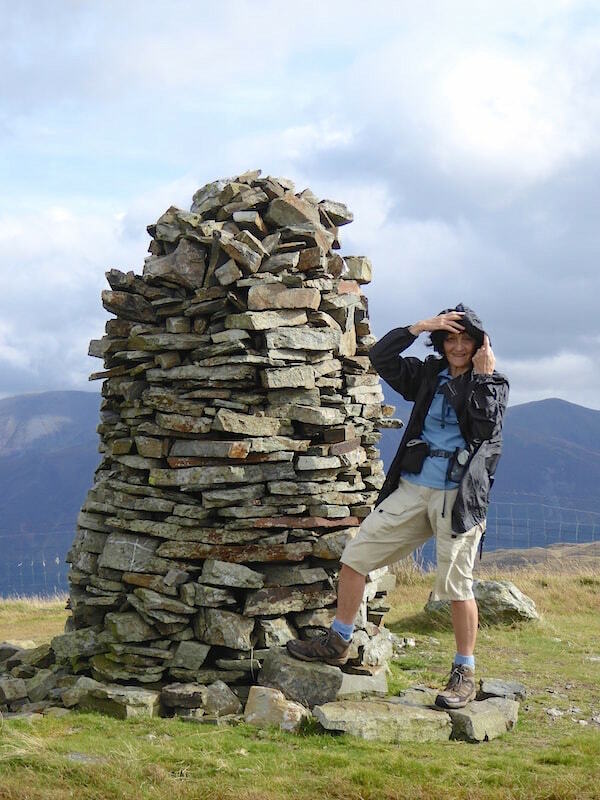 Broom Fell, with its tall cairn clearly visible, is the next one to be visited. 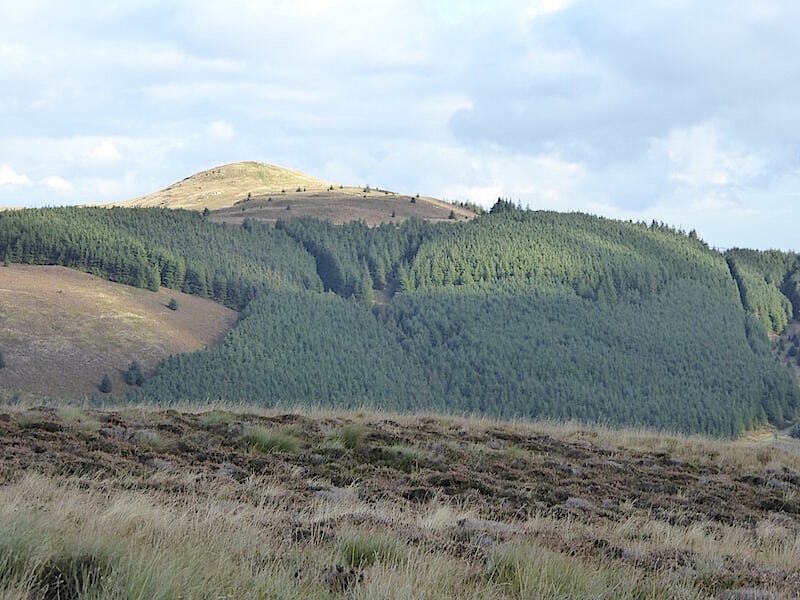 Looking across to Graystones, the one behind the line of trees, from Broom Fell. 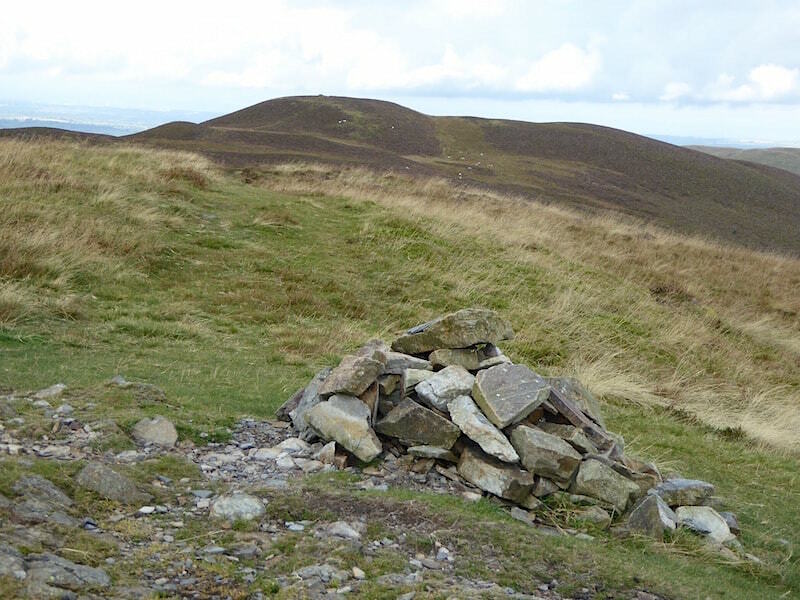 A stile, a cairn, a shelter, a fence and a view of Lord’s Seat, Broom Fell’s got a lot going for it. 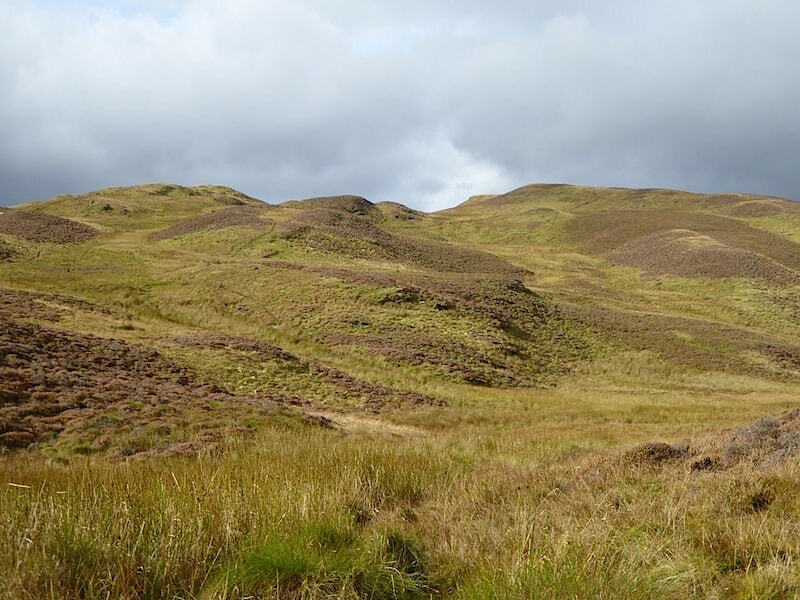 Not a place to linger today, a very strong wind was blowing all the way between here and Lord’s Seat. 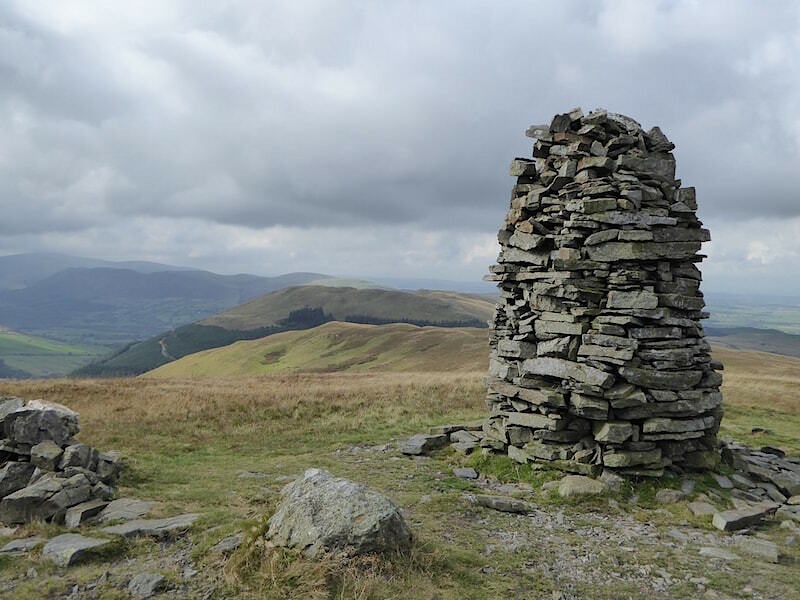 A closer look at Graystones from Broom Fell, at least there were no hailstones on this visit. 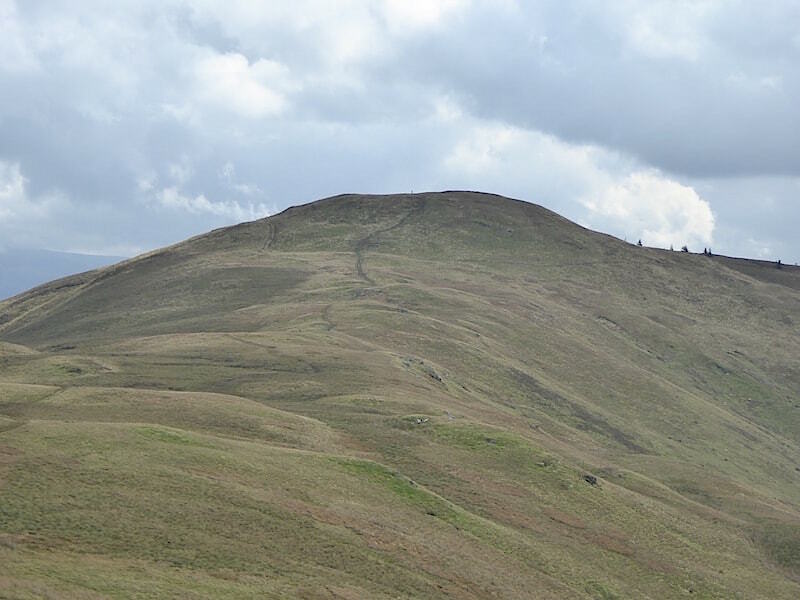 On one occasion we were walking across from Graystones to Broom Fell when we were caught in a painful hail shower which appeared from nowhere and without warning. 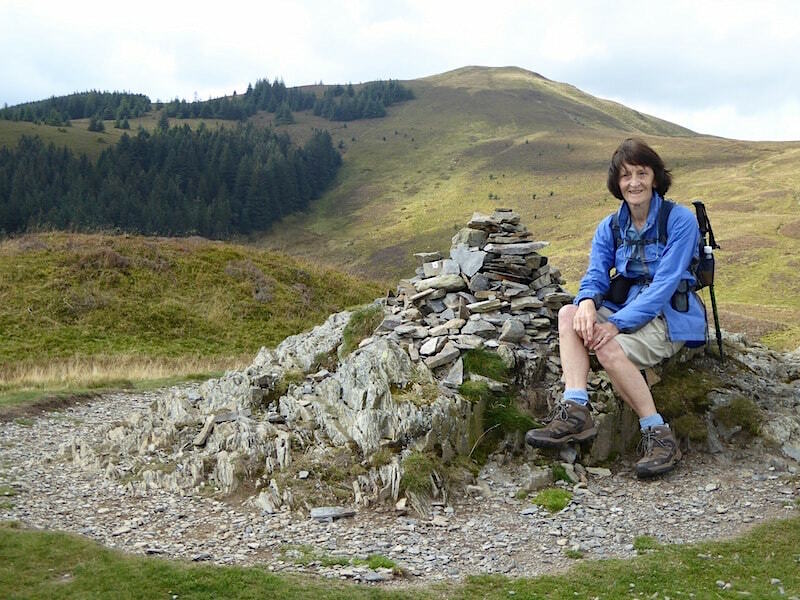 By the time we reached Broom Fell It had stopped, the sun returned and we were back to the hot July day we’d had before. Another close up, this time of Binsey. Now we have to make the return journey back to Lord’s Seat. 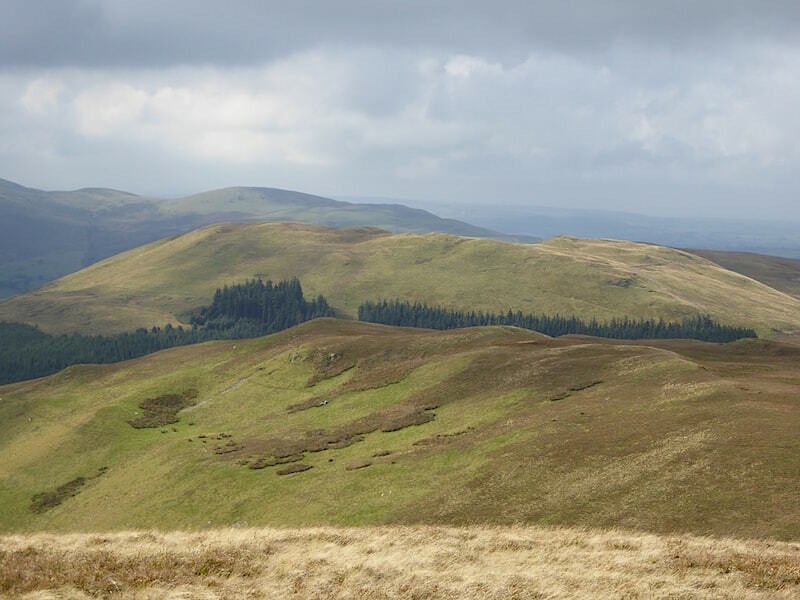 Looking south from Lord’s Seat summit. Now we’re dropping down from Lord’s Seat to Barf. Bass Lake and Binsey from Barf. 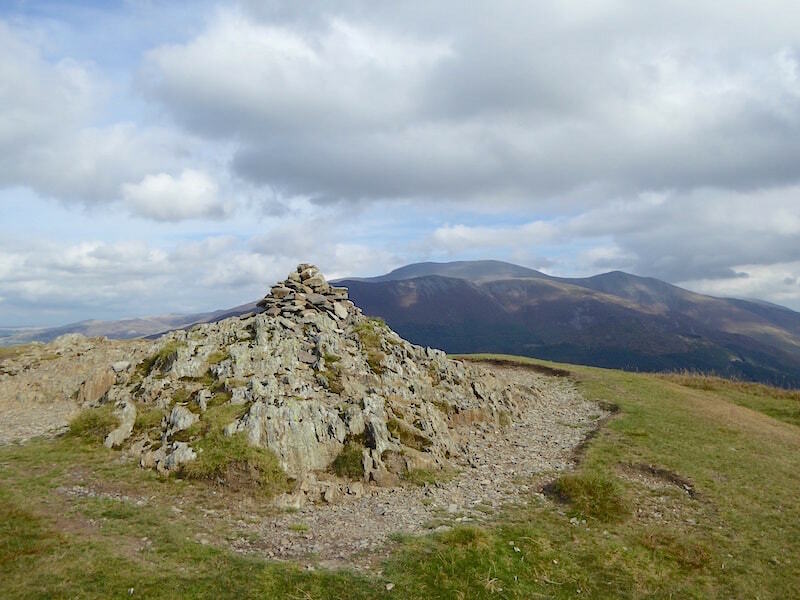 Barf summit, and behind it are Ullock Pike, Longside Edge and Carlside in front of Skiddaw. Looking down at the Keswick end of Bass Lake. 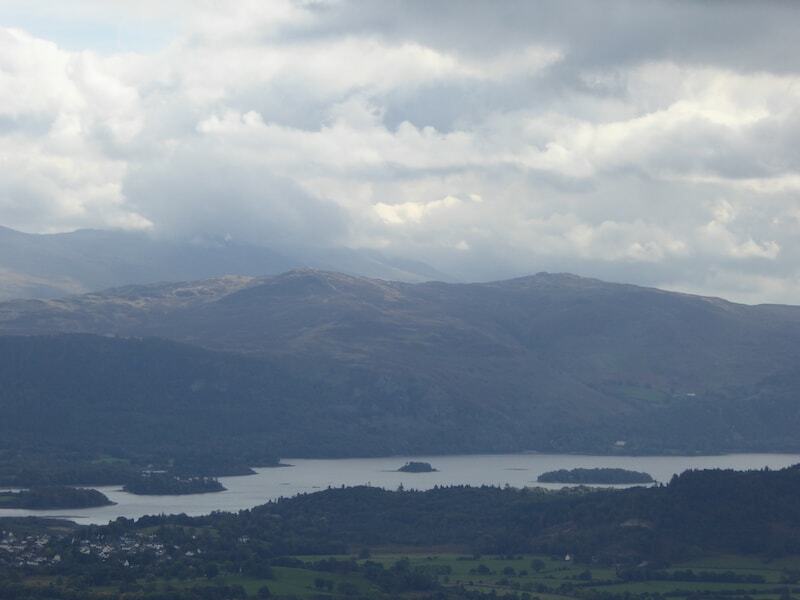 A close up of Derwentwater from Barf. Unfortunately the light went out at this point so things are a bit on the dark side. 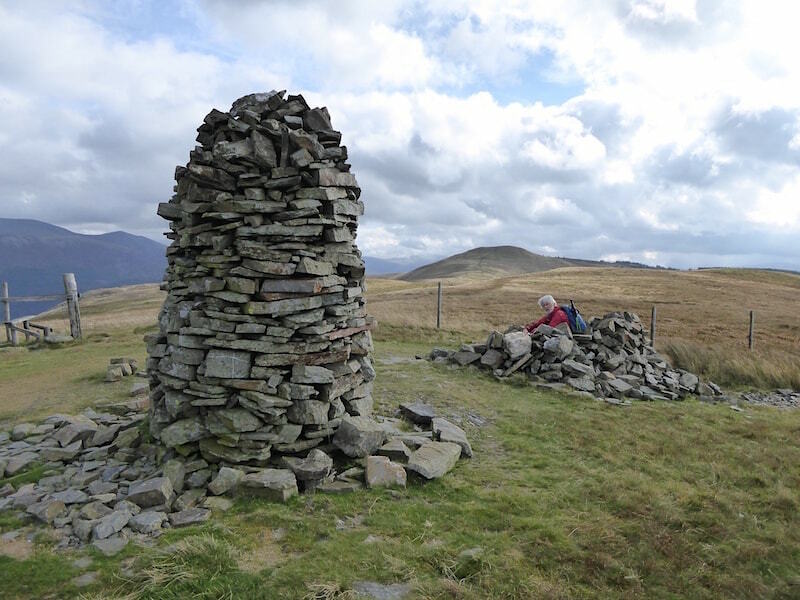 Barf summit cairn. 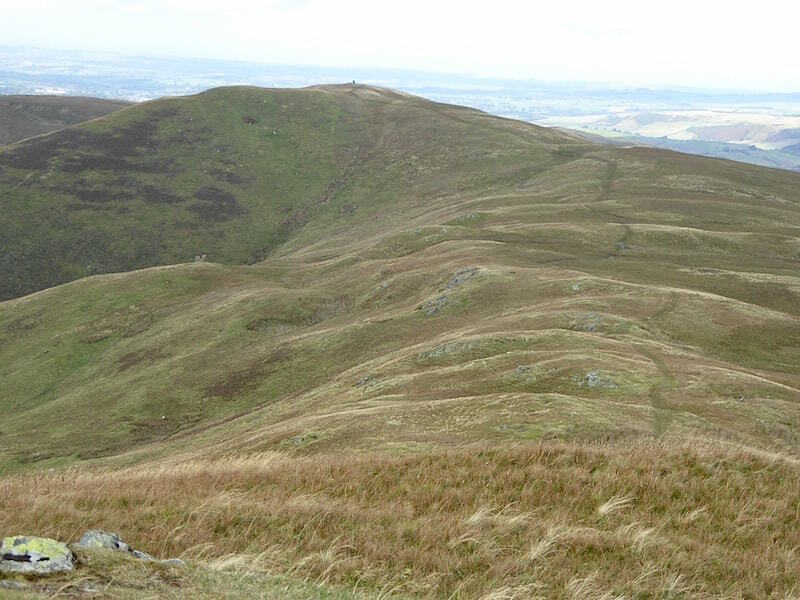 with Lord’s Seat on the skyline. 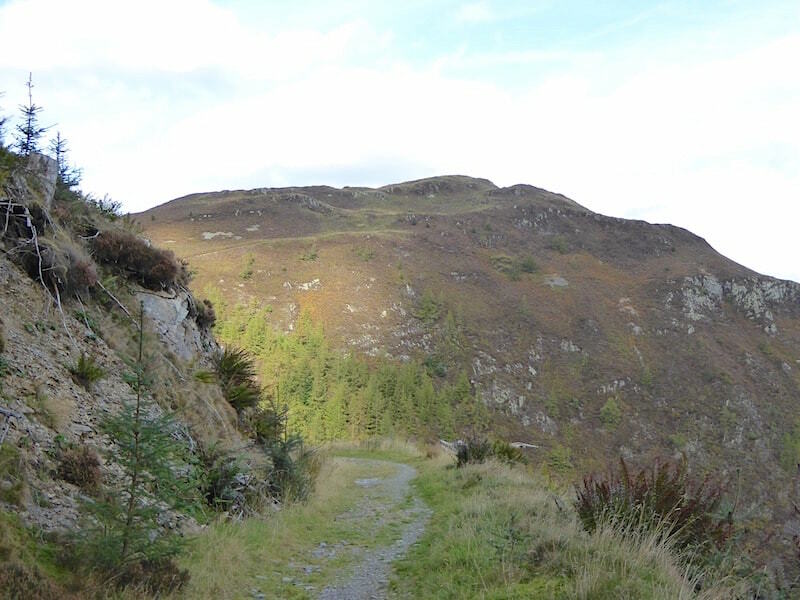 Looking down at the next part of the route back to the Visitor Centre. 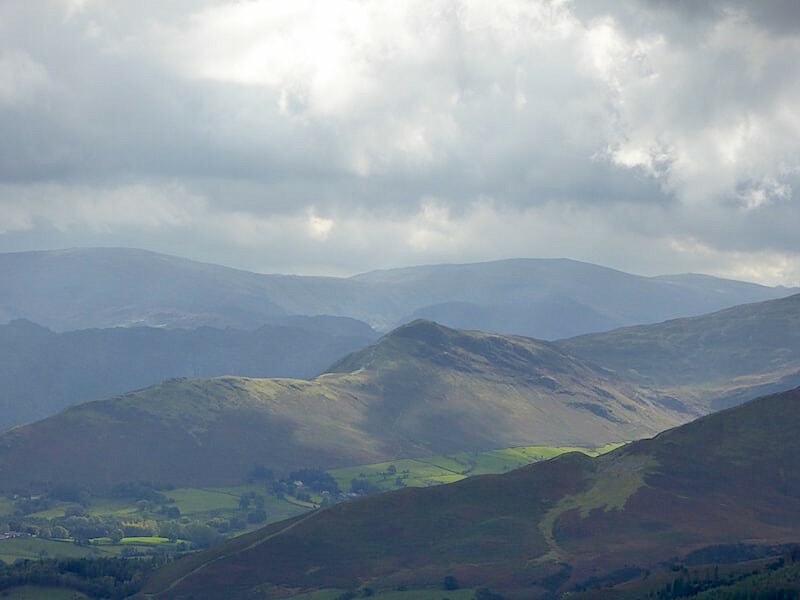 A close up of Catbells from the Barf descent path. 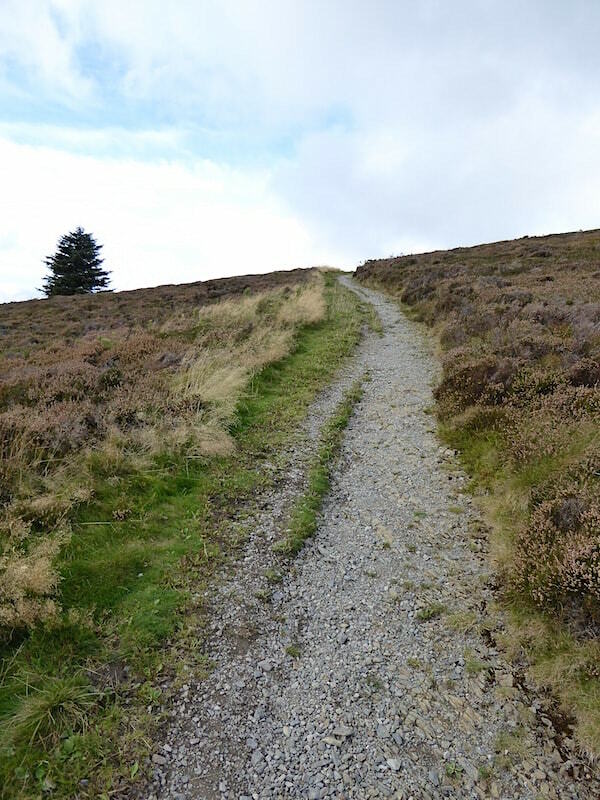 Looking back at the descent path from Barf from just above the crossing at Beckstones Gill. The Bishop of Barf in close up from the forest road return path, with The Old Swan buildings below it. 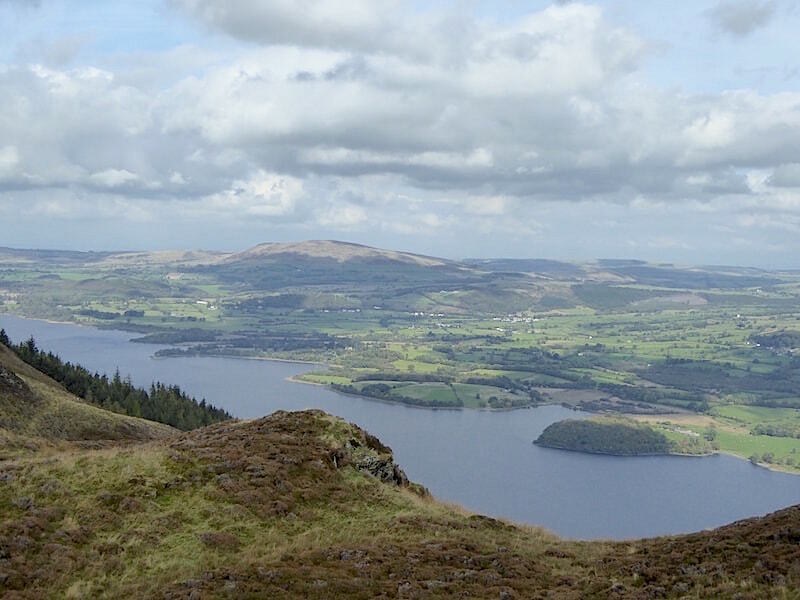 The Bishop is the white painted rock to the left of the shot, marking the spot where, according to local legend, the Bishop of Derry was killed falling from his horse in 1783, after drunkenly betting he could ride up the hill. 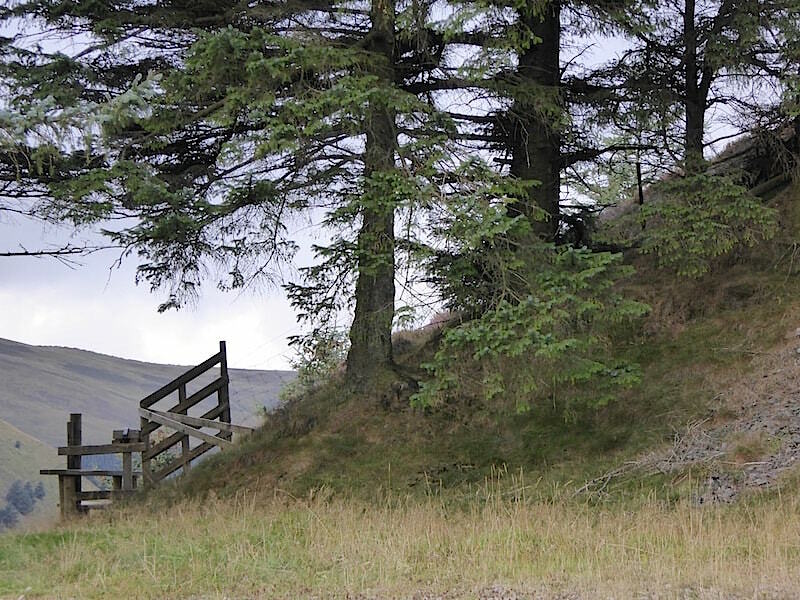 Both the Bishop and his horse are said to be buried near a smaller stone, The Clerk, at the base of the hill. The stone was whitewashed each year by staff at the nearby Swan Hotel until the Hotel was converted to apartments. 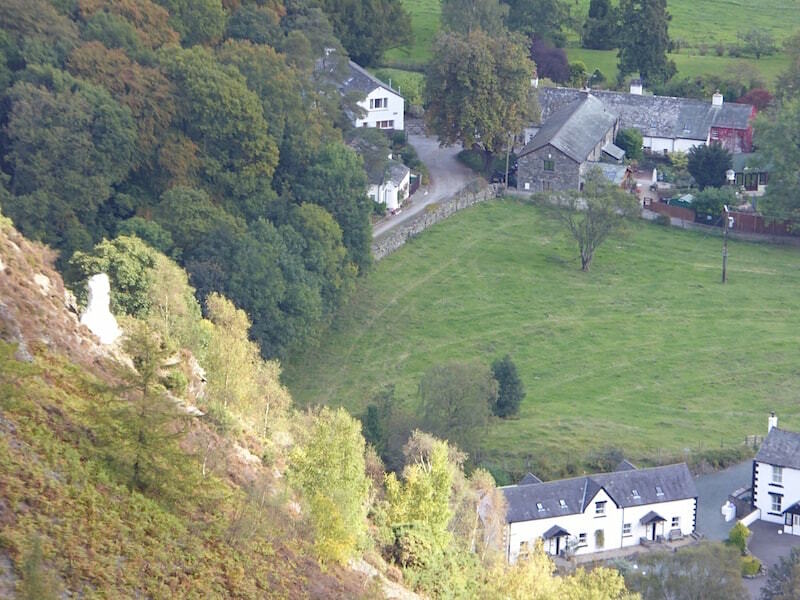 The whitewashing is now carried out by members of Keswick Mountain Rescue. 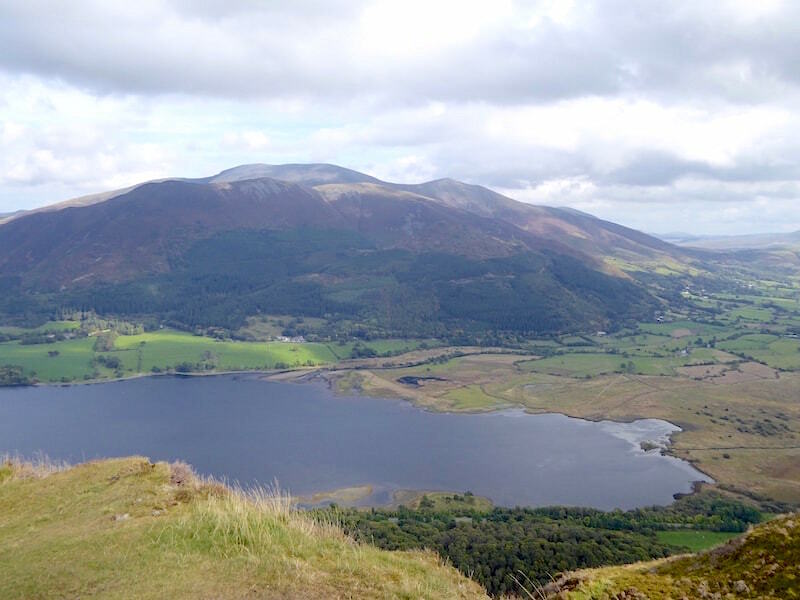 Above Bass Lake are Dodd, Carlside, Longside Edge and Ullock Pike. 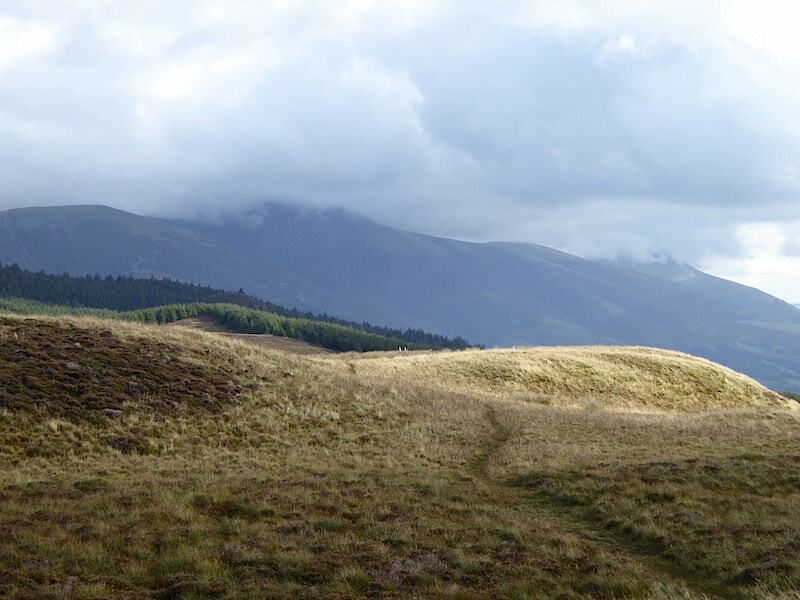 Beyond them is Skiddaw. A look back at Barf from the forest road. 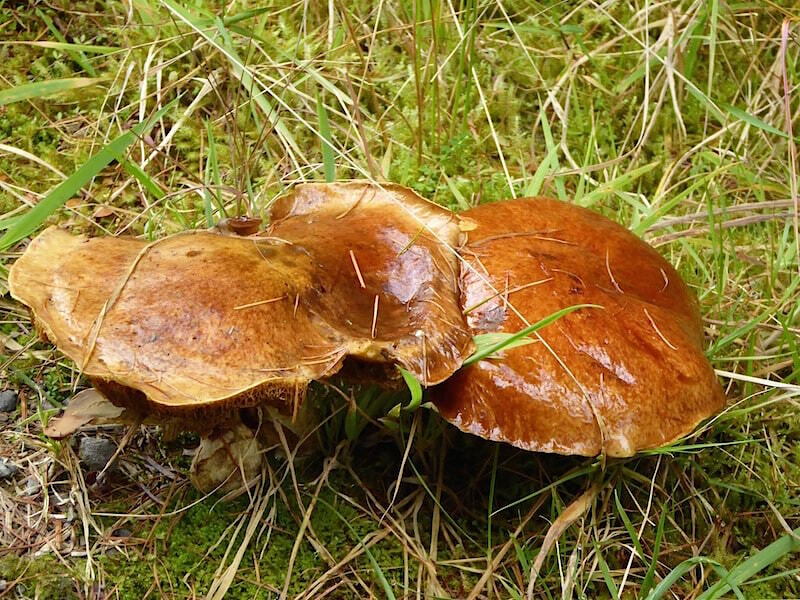 A humungous fungus beside the forest road. 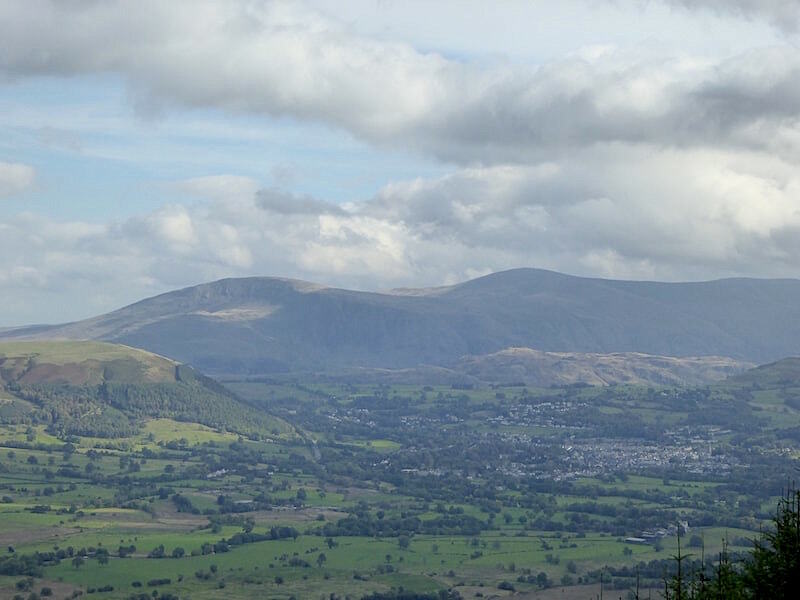 Looking over Keswick to Clough Head and the Dodds. 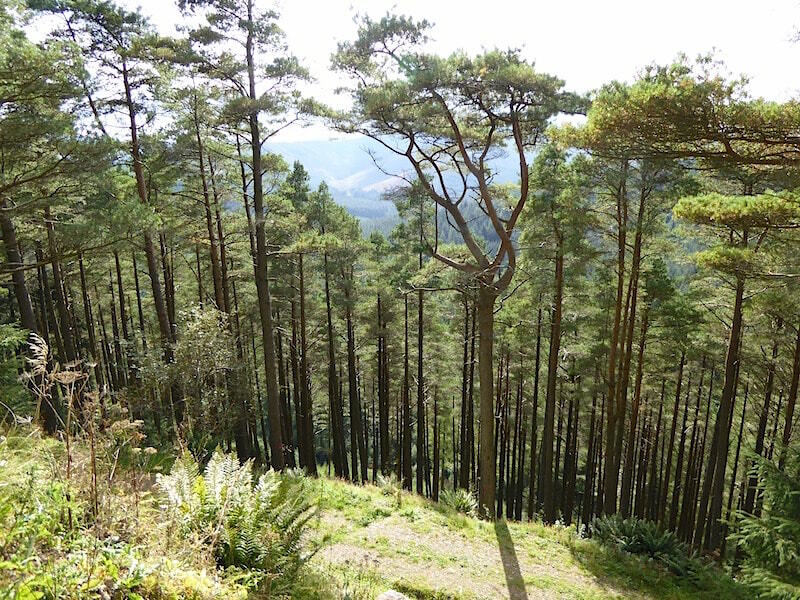 Although they do often spoil the view, occasionally the trees themselves provide a pleasant enough scene. 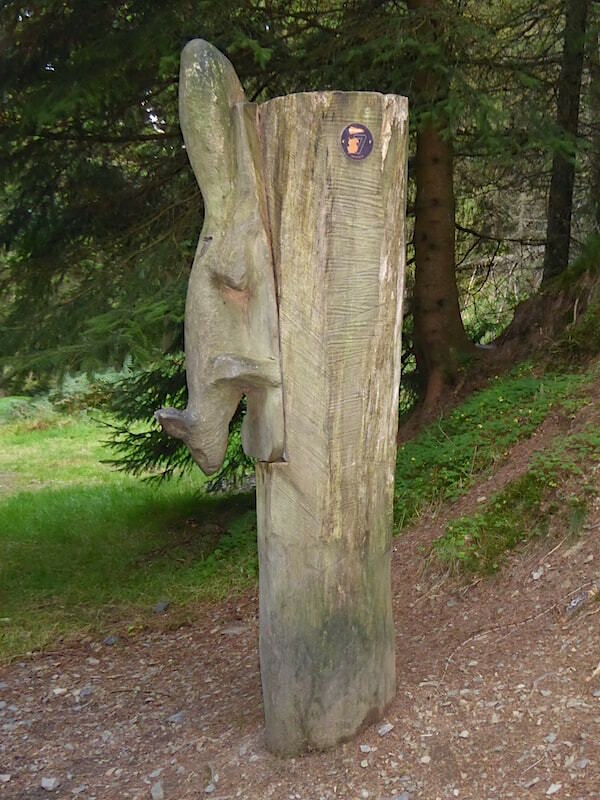 The return path eventually joined up with ‘The Gruffalo Trail’ although this is a carving of a squrrel. 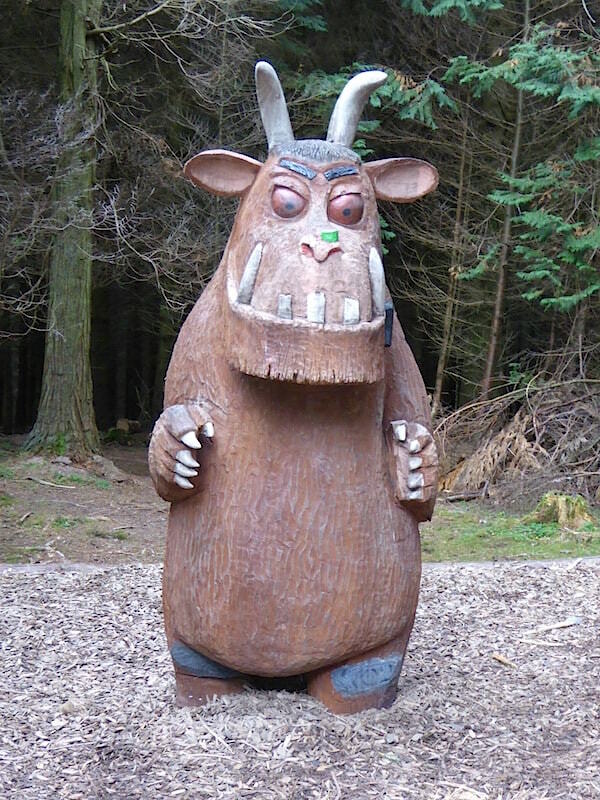 What you find at the end of ‘The Gruffalo Trail’. 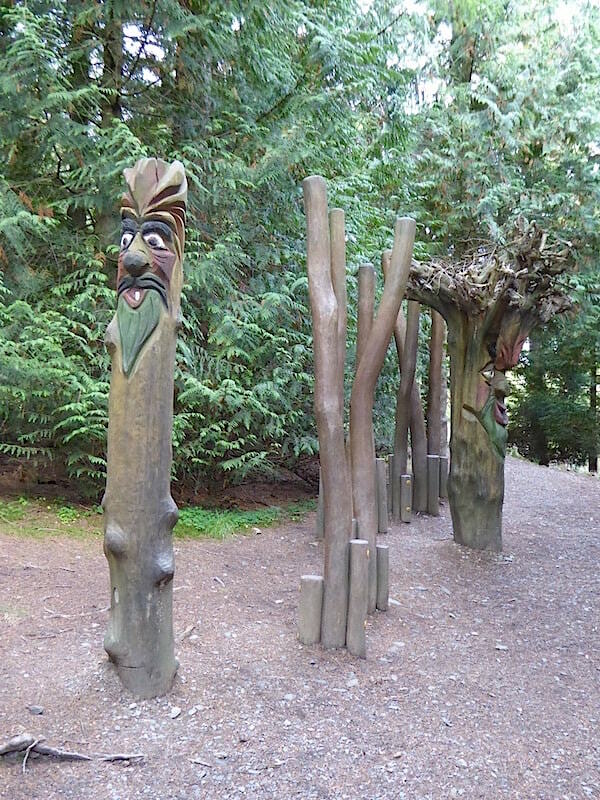 More tree sculptures close to the ‘Go Ape’ area. 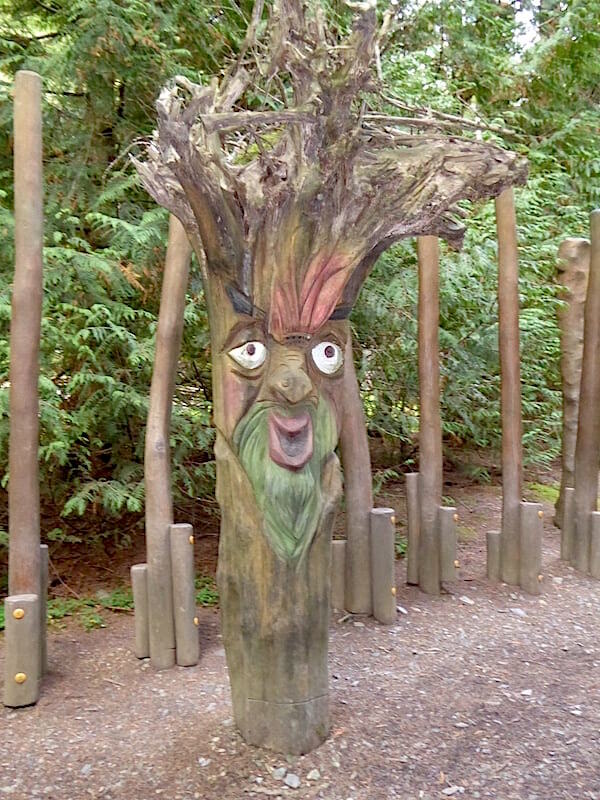 I wonder how many youngsters had nightmares after coming across this. 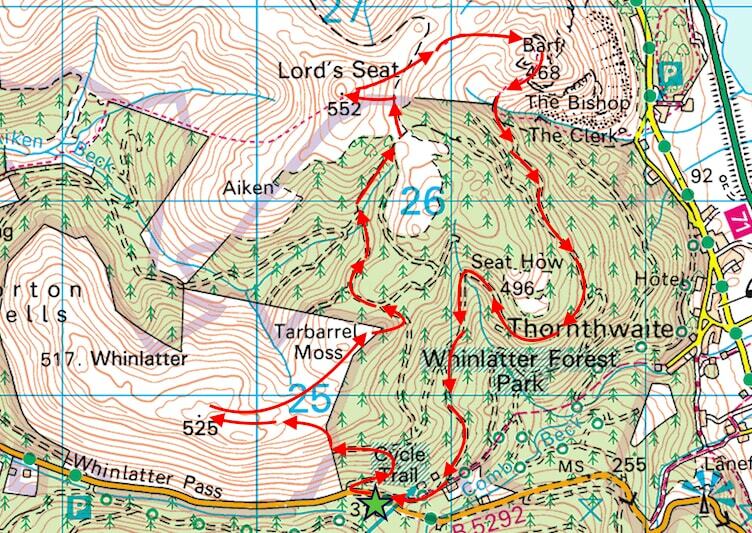 We’re back at the Whinlatter Visitor Centre now so that’s the end of today’s walk. 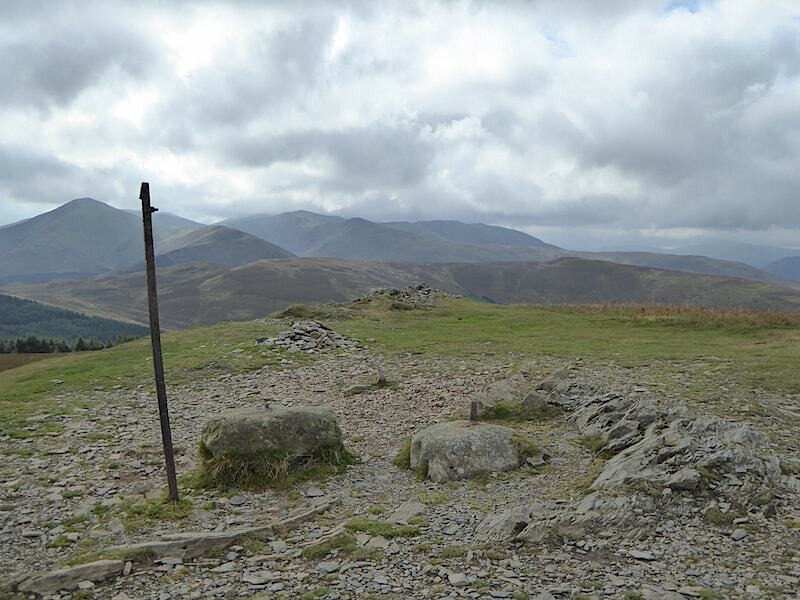 Not a very long walk but no less enjoyable for that, although we could have done without the battering we took crossing from Lord’s Seat to Broom Fell and back.